The veterinarians at Citrus Veterinary Clinic are experienced in performing a wide range of veterinary surgical procedures. Surgeries performed include spay/neuter procedures, mass and tumor removals, and more complicated soft-tissue and orthopedic surgeries. Your pet's safety and comfort are our priority. Because all pets react differently to anesthesia, we perform a complete physical examination and a series of blood tests prior to surgery, so that we may detect any pre-existing conditions that might affect the use of anesthesia on your pet. 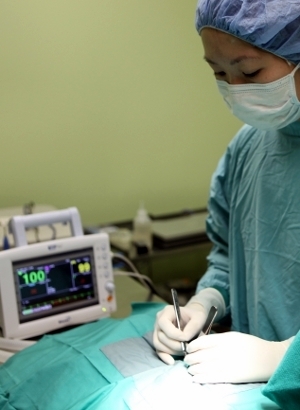 During surgery, your pet is closely monitored. He or she is kept warm and comfortable during the procedure and a specially-trained veterinary technician is also present to assist with the procedure and monitor your pet's condition. Our goal is to keep your pet safe, comfortable and pain-free. Pain management is an important part of our intra- and post-surgical protocols. The less pain your pet experiences, the faster his or her recovery time. We provide pain medication to all pets following surgery. At discharge, we may send additional pain management medication home with you and your pet. If you would like to spend additional time with the veterinarian you may schedule a pre-surgical consult prior to the day of the procedure. It is generally difficult to give you a specific time for your pet's surgery. Scheduled surgeries are not performed based on the order of check-in but on the procedures being performed that day. Feel free to call during the day to check on your companion's surgical and recovery status. Your pet will be assigned a technician who can update you regularly. You'll be able to talk to the veterinarian when you pick up your pet at the end of the day to go over surgery aftercare.